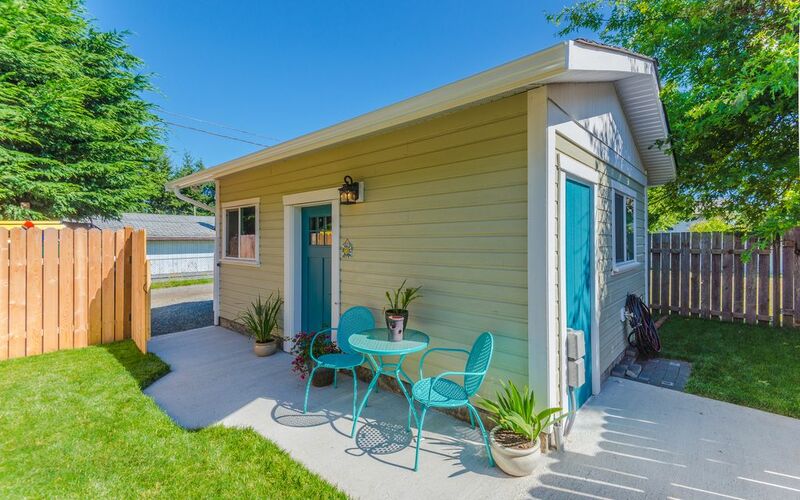 Welcome to the Little Acorn Cottage where you'll find a cozy home in heart of Ladysmith's oceanside community. This cottage offers a private yard and parking, is fully furnished with kitchen and has WiFi, Netflix and a smart TV. The bedroom is open to the living space, so most appropriate for 1-2 people. The property is located a few blocks from downtown Ladysmith, where you will find restaurants, shopping and groceries as well as waterside fun at Transfer beach. Also keep an eye out for our additional rental The Ladysmith King Suite and one more that will be posted shortly. The cottage welcomes your well behaved pets. There is an additional fee of $15/night per pet that is added after your initial reservation is confirmed. We aim to keep costs low for our guests, so we ask that all visitors participate by leaving your unit tidy, with dishes clean upon check-out. Parking for one vehicle is provided, if you need additional parking please ask us for suggestions. Cleaning fees will vary for weekly and monthly stays. Living area is limited, bedroom efficient and kitchen well equipped. Stays cool during the day. Cools down quickly on hot days. Little Acorn Cottage is very good value. We really enjoyed staying at the "Little Acorn". The place was very clean, private and tastefully done. The bed was so comfortable which was a bonus. It had everything we needed, we would definitely stay there again. Great value for the money. Clean and modern with all the necessities of home. Great location close to hiking trails in a lovely little town. Best bakery on the Island. Rates are subject to change until reservations are confirmed. Guests are responsible to clean their own dishes and leave the home in a clean state, otherwise additional cleaning fees will apply at a rate of $40/hour. Yard is to be kept clean of all pet waste. Visits exceeding 3 nights are subject to additional Cleaning Fees. Strict No Smoking policy.